Demand for Mobile Business Intelligence (BI) has risen dramatically over the past 18 months. The continued and unprecedented emergence of tablet devices for work and play, an increasingly mobile workforce, and the need for real-time insight at any moment, has resulted in new vendor offerings and shifting consumer demand. Many organizations are looking to leverage the ability to receive and disseminate reporting and analytics from mobile devices in order to stay informed, make timely decisions and boost productivity. New Web-based technologies and applications have emerged in an attempt to meet expectations. The latest version of Dresner Advisory Services’ (DAS) Mobile Business Intelligence Market Study – the most comprehensive research series currently available on Mobile BI trends and usage – provides a thorough exploration of the Mobile BI industry. 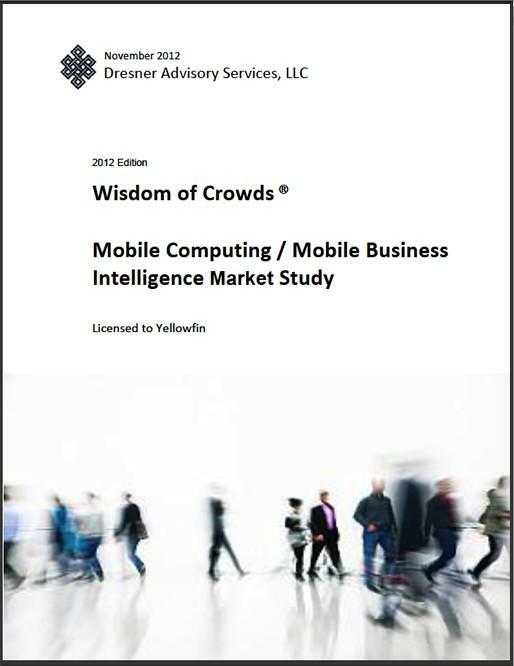 The November 2012 study, DAS’ fourth Mobile BI study comprising over 250 global organizations, ranks the mobile capabilities of 25 of the world’s most prominent BI vendor’s, according to the number of platforms supported, the level of platform integration, customer ratings, as well as breadth and depth of features offered. Discover why report author, former Gartner Research Fellow and President and Founder of DAS, Howard Dresner, said that new technologies and attitudes – affecting the consumption of business information – now meant that Mobile BI was a clear strategic focus for BI customers and vendors alike. Yellowfin claimed the second highest score in DAS’ 2012 study, outscoring many high profile Mobile BI vendors, including Tableau, Roambi, TIBCO Spotfire, SAS, SAP, QlikTech, MicroStrategy, Information Builders, IBM, Dimensional Insight, Birst and Actuate. Yellowfin’s Mobile BI platform scored a total of 28.82 points out of a possible 36.5, awarding the Australian based vendor the outright second highest score. The highest score achieved was 29.20. Yellowfin was awarded the equal second highest score in the previous two versions of the report. There are many benefits of Mobile BI, including increased competitive advantage, customer satisfaction, improved ROI and workforce productivity. All these benefits are derived from the ability to enable mobile workers with actionable information. A study released by analyst firm Aberdeen Group – Mobile BI: Actionable Intelligence for the Agile Enterprise – found that companies with Mobile BI could make critical business decisions six times faster than organizations without a mobile platform for reporting and analytics. Results from a recent study by market intelligence firm, TechNavio, forecast the worldwide Mobile BI market to increase at a compound annual growth rate of 27.47% over the period 2012 – 2016. The report, entitled 2012-2016: Global Mobile Business Intelligence Market, put total spend on Mobile BI devices and software at $702 million in 2012, predicting that figure to rise by another 25% to $878.1 million in 2013, reaching a staggering $1.8 billion by 2016. Yellowfin offers customers the ability to receive mobile analytics out-of-the-box, on any device or platform at no additional cost, via native applications for the iPhone, iPad and Android platforms, Web-browser or HTML 5 integration.